Michael N. Marcus is an author, businessman and April Fooler. Born in April, Marcus says April Fools' Day and Halloween are his favorite holidays. For nearly ten years, he's "pranked" electronics manufacturer Panasonic in early April, but this year his perennial victim has gotten tough, and has threatened court action to block the pranking. Marcus remains defiant despite the threat. Marcus is president of AbleComm, Inc., a Connecticut-based supplier of telecommunications equipment. The company's main phone system brand is Panasonic. Marcus said, "I also own some Panasonic stock, and I review Panasonic electronic products on my GottaGet1 blog. I have a lot of respect for the company, but that doesn't mean I can't have some fun with it." Marcus continued, "Since the mid 1990s, I've distributed an April Fools' news report about a mythical press conference that took place at a non-existent hotel, where fake people announced fake corporate policy changes and fake new products. For those who were in on it, It became an eagerly awaited annual tradition. Lots of people love my spoofs, but gullible victims, of course, don't. Some of my fake news has actually become real news in later years." The annual custom reached a new height in April, 2008. Marcus realized that the public and the news media were becoming increasingly sophisticated and skeptical of "news" distributed with a 4/1 date. So, to enhance credibility, he skipped the first of the month and distributed a spoof two days later. Early on April 3, 2008 he launched a 90%-false press release. The press release contained several revelations, but the most important was that Panasonic would be manufacturing cellphones with plasma video displays. A few months earlier Panasonic demonstrated the world's largest plasma TV, so Marcus decided they should also have the smallest. Through very lucky timing, a few days before the "news" went out, AT&T had announced their Mobile TV service for watching shows and sports on cellphones, which added usefulness and legitimacy to the fictitious device. Within a few hours, the story was picked up and published by websites around the world. Many news writers added original material to demonstrate their extensive knowledge of the phony subject; but only one of them called Marcus to check on the story, and Marcus told him that it was a spoof. Mobileburn.com was particularly fanciful in enhancing the fake news. They said "Panasonic took the stage at CTIA 2008 this week with partner AbleComm to announce that it has been working with AT&T to develop plasma displays for mobile phones, for use with the carrier's new Mobile TV service." There was absolutely nothing in the news release about an appearance at the CTIA event or Panasonic "working with AT&T.". Crunchgear.com had a headline that read, "AT&T wants Panasonic to develop plasma screens for cellphones." The news release never said that, and neither did AT&T. Some people at Panasonic laughed as expected, but some, particularly new employees who were unaware of the tradition, were upset. One outraged exec sent an email saying that Marcus caused "people to lose thousands of productive working hours." Panasonic demanded that the news distribution service that Marcus had used issue a retraction -- and this added fuel to the fire. The retraction generated more coverage of the fake news, and personal insults, Marcus explained. "Several websites that received the retraction accused me of forgetting what day it was. One critic with dubious credentials said it was a "late, poorly executed April Fools' joke," and another called me an April Idiot. Actually it was not late, and it was extremely well executed, and my mother didn't have any stupid kids." "There's certainly no rule that limits hoaxing to one day per year," Marcus continued. "No one who was filmed for TV's Candid Camera on 3/20 or 10/15 objected because it wasn't 4/1. Similarly the celebrities who were victims on the MTV show Punk'd may have grumbled, but not because they were not punked on the first day of the fourth month. And the subjects of "Stuttering John" interviews on The Howard Stern Show didn't check the date before deciding to participate." Many of the websites that ran the news of the retraction, but had not run the original fake news, ran it with the retraction, thus increasing the circulation and readership of the spoof. Dailytech.com said, "Yesterday AbleComm sent out a press release that was all very believable talking about how Panasonic was going to be using small plasma displays in a mobile phone designed to be used on the new AT&T Mobile TV service launching in May. The release was professional, interesting and all very plausible replete with quotes from Panasonic and all. It didn't take long before the story was all around the internet…"
Some websites were actually suspicious of the retraction. Phonemag.com said it "Looks like someone let the plasma cat out of the proverbial bag too soon, and is now desperately backtracking to try to salvage a business relationship. It's unclear whether this was a deliberate or accidental occurrence, though the release was sizable and contained multiple quotes from all the parties involved which lends weight to the idea that it was an authentic document prematurely distributed." In anticipation of another April Fools "attack" this year, Panasonic's law firm Katz, Honigman, Shapiro and Flynn sent a registered letter to Marcus last week warning him against further spoofing. The attorneys told Marcus that "unless you agree to restrain yourself, Panasonic will go to Court to obtain a restraining order against you." Years earlier, Panasonic's in-house legal department had warned Marcus not to contact the then-new head of Panasonic's Business Telephone Systems division, and Marcus refused to obey. Now in 2009, Marcus is once again making a stand for freedom of speech and freedom of fun. He said, "It's ridiculous that the company that I have invested my money in, and that makes products that I sell and recommend, will spend money and time merely because they have no sense of humor. I will not be silenced. I will not obey a "gag order" even if they convince a court to issue one. We are living in dark times, and Panasonic and the rest of the world need to lighten up." "Freedom of speech is a fundamental part of American culture," Marcus emphasized. "In 1791 it was guaranteed in the very first Amendment of the U. S. Constitution. Even earlier, in 1215, free speech was included in the British Magna Carta, and the caliph Umar incorporated free speech as part of Islamic law in the 7th century." 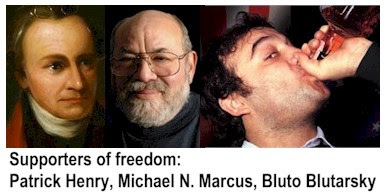 Marcus invites all supporters of free speech, both serious and spurious, to gather on April 1 at 2:00 p.m. at the Patrick Henry National Memorial in Virginia, about 35 miles south of Lynchburg. Patrick Henry is known for his immortal words supporting the American Revolution in 1775: "I know not what course others may take; but as for me, give me liberty or give me death!" The rally will take place at the Orator's Stage, near Henry's grave and law office. All attendees will be allowed five minutes each to address the audience on any topic. While there will be no censorship, Marcus urges that speakers "keep it clean" because there will probably be children in the audience. The address is 1250 Red Hill Road, Brookneal, VA 24528. Marcus noted, "My former spoof victims and passive co-conspirators have been eagerly waiting to see what I would devise for this year. I won't let them down and will not be intimidated by lawyers. I'm reminded of what John Belushi said in his Bluto Blutarski role in Animal House: "Over? Did you say 'over'? Nothing is over until we decide it is! Was it over when the Germans bombed Pearl Harbor? Hell no!" The merry prankster proclaimed, "I proudly reiterate the defiant words of Bluto Blutarsky. I say to Panasonic and to its uptight attorneys, Hell no!" "It's time they realize that pranks, spoofs and put-ons are part of normal American life, and should be responded to with a smile, not an injunction," Marcus concluded. "Besides, most people know not to believe anything they read on the first day of April."